Watch Saba perform “Photosynthesis” at the Supra Hesh 3 release in LA. Corporate parties can be an uphill battle for most any artist. Often small affairs, with strict guest lists, there usually isn’t a lot of room for “real fans.” Throw in the fact that Saba is a relatively niche and somewhat cerebral rapper who starts his set with a song repeating “I’m so alone,” and you might think it would all end terribly. But this time, the long shot won. Saba made note of the potential awkwardness off top and used it to his advantage in most of his crowd banter. Coming out to a cold reception of his track “BUSY” then powering through a spot on live performance of “BROKEN GIRLS,” and showing off some of his notable features like his song with Chance The Rapper, “Angels,” Saba took the time between each song to reiterate that he knew a lot of people in the crowd might not know who he is, but they should still rock with him. Rock with him they did. It’s clear this man’s been polishing his stage chops for years now. His mic control is impeccable, his crowd control is encouraging rather than spiteful (a common rookie mistake), his voice is audible and clear with nary the use of a backing track. It’s a skill he’s been honing for years in Chicago, before beginning to tour the country and internationally over the last couple. Some of the familiar faces he came up with in Chicago, like Noname and Smino, were in attendance rooting for their hometown guy. He managed to make what could’ve been a lifeless audience into a participatory crowd, winning over newcomers and impressing those already familiar. It was a masterful and energetic performance that’s not easy to come by. Check it out and be sure to catch our podcast interview with Saba. 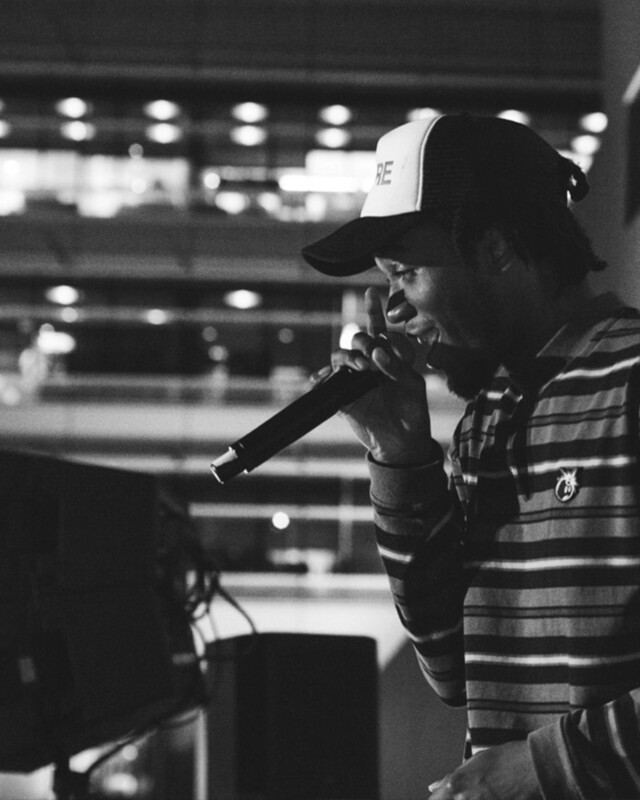 Duckwrth performs at Troc Balcony in Philadelphia.